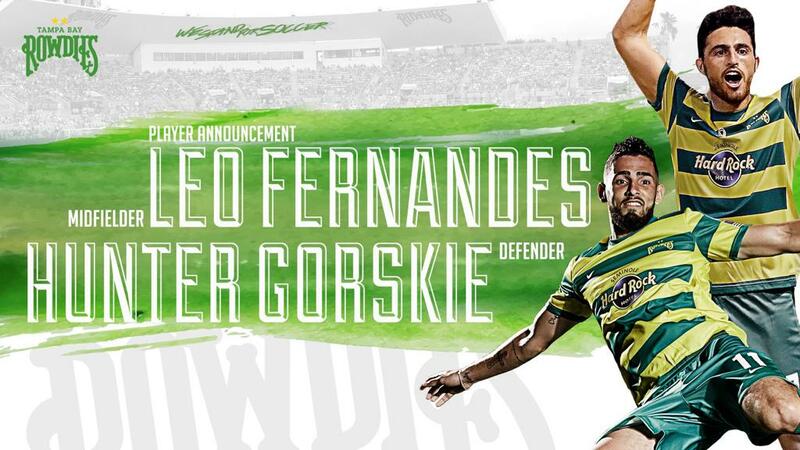 ST. PETERSBURG, Fla. (January 3, 2018) — Two key members of the Tampa Bay Rowdies’ 2017 roster have signed new contracts with the club, with midfielder Leo Fernandes and defender Hunter Gorskie each set to return in 2018, pending USSF and USL approval. Per club and league policy, further contract details were not disclosed. Fernandes signed with the Rowdies last offseason and got off to a promising start in 2017, helping Tampa Bay to an opening day win over Orlando City B by drawing a penalty which was ultimately converted by Georgi Hristov. A former New York Cosmos and Philadelphia Union player, Fernandes is most often deployed on the left wing and is always a threat to cut inside onto his right foot. He was named the NASL’s Young Player of the Year in 2015 after scoring eight goals and providing two assists. Gorskie, 26, joined the Rowdies in late August of last year and made an instant impact on the back line. He started all 10 matches the Rowdies played after signing him and scored three goals. In his 10 matches, the Rowdies lost just one match in regulation. With Fernandes and Gorskie securing their returns to Tampa Bay, the Rowdies now have 11 players returning from last seasons record setting year. The Rowdies will have additional signing announcements in the next two weeks as their 2018 United Soccer League roster is built. COME ON YOU ROWDIES!